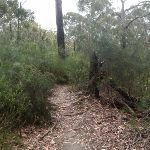 (0km) Pennant Hills station → Mambara east int. 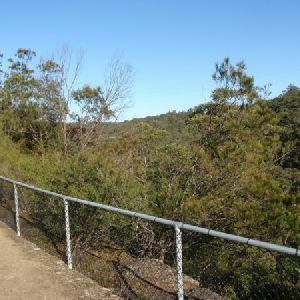 From the platform the track heads out onto Railway street, turns right and continues up towards Pennant Hills road. 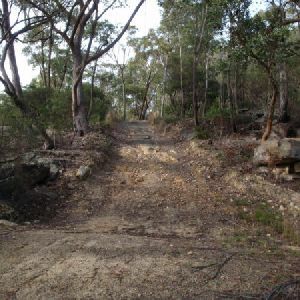 Before it reaches the main road, the track heads up a short set of steps and up the ramp to the overpass, where it crosses the main road and continues down the other side to the bottom. 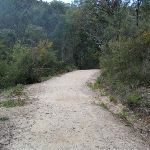 Turning right at the main road, the track follows the footpath along the main road east for a short distance to the intersection of the Cresant. 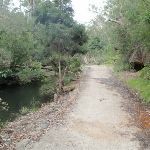 From the intersection the track follows the Cresant down the hill and along to the end of the road turning left and then immediately right onto Charlotte road which joins onto Brittania street and to the intersection of the Pennant Hills Park entry at the round about. 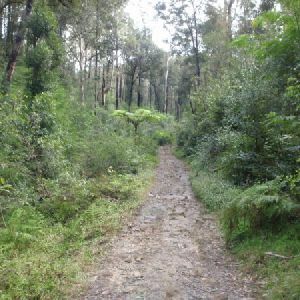 Turn right: From the intersection the track follows the bushtrack down off the footpath and down the hill, winding along to the intersection of the unnamed bushtrack. 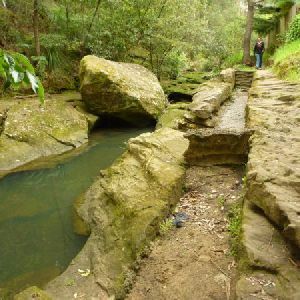 Veer left: From the intersection the track off the rock platform and down the hill, winding through the bush following the cheltenham sign along the side of the valley for a long while until continuing down some wooden steps to the telegraph pole at the intersection of the bushtrack. 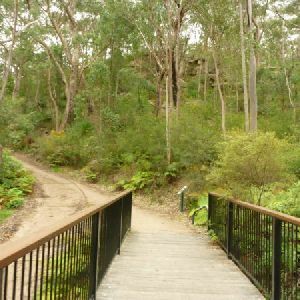 Veer right: From the intersection the bushtrack follows the powerlines, down the gentle hill and down the long set of steps to the bottom where it crosses the creek to the signposted intersection of the Cheltenham bushtrack. Veer right: From the intersection the track follows the service trail south east down the gentle hill and through the valley until it drops down across a creek and continues up the other side to the intersection of the Epping bushtrack. 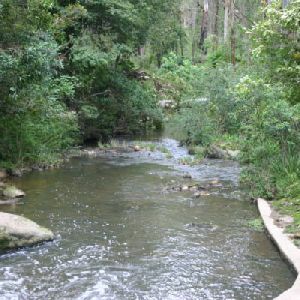 Veer left: From the intersection the track follows the Lane Cove River arrow along the servicetrail for a while before it loops around the top of Big Ducky Waterhole. 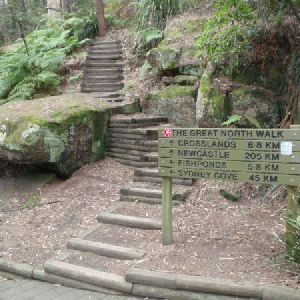 Turn left : From the intersection the track follows the Pennant Hills ovals sign up the steep rocky service trail winding all the way up the side of the valley, flattening out to a gentle climb as it approaches the top and passing the intersection of a powerline service trail, continuing along the top of the ridge all the way to the intersection of the second second powerline service trail. 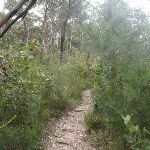 From here the track continues along the ridge, following the service trail through the thick bushland all the way to the intersection of the third powerline service trail. 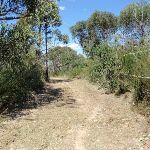 Continue straight: From the intersection the track follows the service trail winding up the gentle hill and turning right at the archery warning sign, continuing through the bush to the intersection of the airfield service trail. 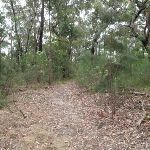 Turn left: From the intersection the track follows the service trail west through the bush up a long gentle hill and through a metal gate to the intersection of the Pennant Hills park road. 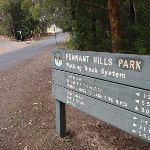 Veer right: From the intersection at the National Park gate the track follows the road up the gentle hill as it passes several tennis courts, football and hockey fields as it winds all the way up to the intersection of the bushtrack behind the “Pennant Hills Park walking track system” sign on the left side of the road. 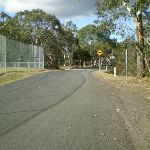 Continue straight: From the intersection the track heads up the road keeping the sports oval on the right of the road as it comes to the round about. 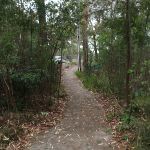 Turn right: From the roundabout the track follows Britannia street up past the two large ovals and continuing all the way along, winding around the left and right hand bends in the road which becomes the Cresant, and heads up the hill to the intersection of Pennant Hills road. 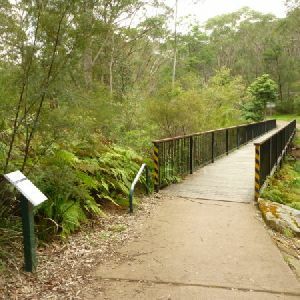 From the intersection the track turns left at the main road and follows it along the footpath for a short distance to the bottom of the overpass, turning left up the ramp that winds all the way up and over the road coming back down to the intersection of Railway street. 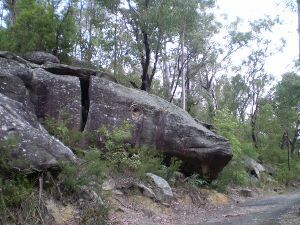 From the intersection the track follows Railway street down the hill and past the bus stops to the entrance to the train station. 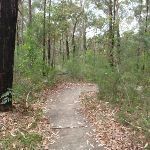 3.9km of this walk has gentle hills with occasional steps and another 2.9km is flat with no steps. 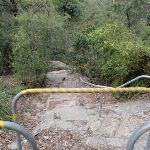 The remaining (1.3km) is very steep. 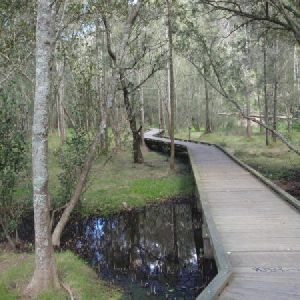 3.5km of this walk follows a smooth and hardened path and another 2.4km follows a clear and well formed track or trail. 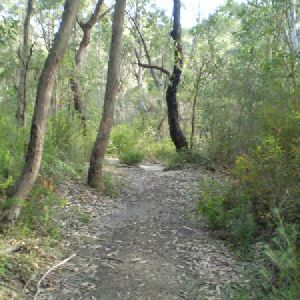 The remaining (2.2km) follows a formed track, with some branches and other obstacles. 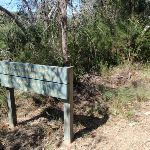 Around 4.3km of this walk is clearly signposted, whilst the remaining 3.8km has directional signs at most intersection. 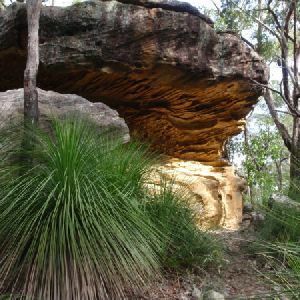 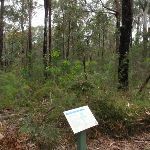 Around 6km of this walk requires no previous bushwalking experience, whilst the remaining 1.9km requires some bushwalking experience. Around 7km of this walk is not usually affected by severe weather events (that would unexpectedly impact safety and navigation), whilst the remaining 790m is affected by storms that may impact your navigation and safety. 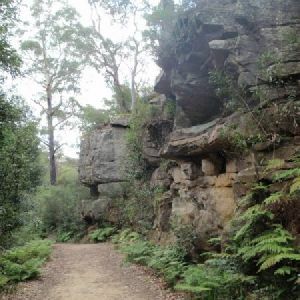 Around 5km of this walk is close to useful facilities (such as fenced cliffs and seats), whilst the remaining 3km has limited facilities (such as not all cliffs fenced). 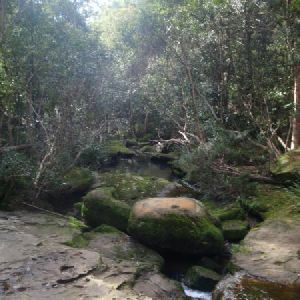 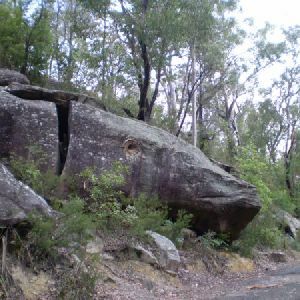 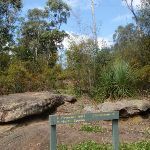 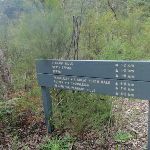 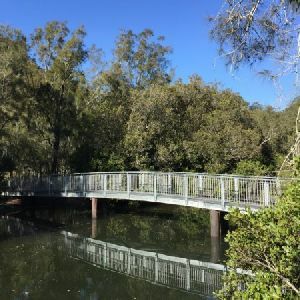 A list of walks that share part of the track with the Pennant Hills Park loop (via Lane Cove River) walk. 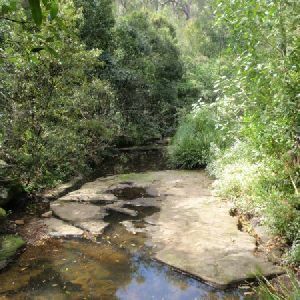 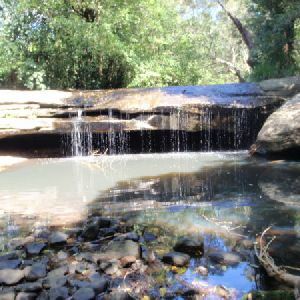 A list of walks that start near the Pennant Hills Park loop (via Lane Cove River) walk. 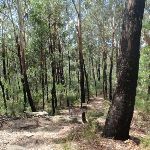 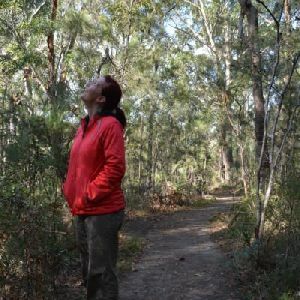 http://new.wildwalks.com/wildwalks_custom/includes/walk_fire_danger.php?walkid=nsw-lcnp-phpllcr Each park may have its own fire ban, this rating is only valid for today and is based on information from the RFS Please check the RFS Website for more information.